SJ Product – Unique Web design for product collection. This flat design template provides 5 nice preset color styles: Blue (default), Red, Cyan, Green and Orange. You can preview how they look as well as customize the Layouts, Menus, Typography and Reset instantly by using dynamic Cpanel through a standart web browser. In interest of using YT FRAMEWORK V2, this template is totally responsive design as well as easy to configure with a wide range of easy tasking features: colors scheme, menus, typography, Google Font… Specially, this is compatible with Auto Updater component of Joomla! to update framework any time to latest version from our repository. As other SmartAddons’s templates, SJ Product has Boxed and Wide layouts. In which, you can easily change the background for Boxed layout with provided patterns. The template provides 5 different Preset Color Styles: Blue (default), Red, Cyan, Green and Orange. Just pick up the favourite one. Besides, it absolutely allows you to control color schemes and other parameters in back-end. You can change Theme Styles, Layouts, Menus, Typography and Reset instantly through a standard web browser… by using c-Panel. 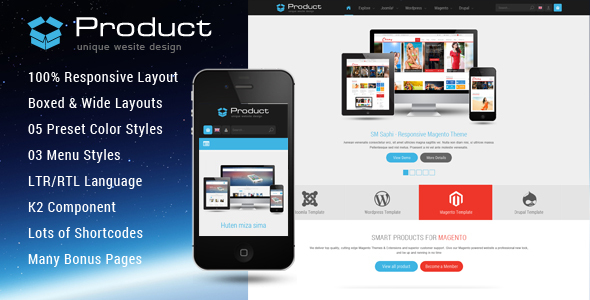 SJ Product supports 3 types of menu: Mega Menu, Css Menu and Moo Menu. With our Mega menu, you can add a multi-category, multi-article with description, price, image, video, effects… or even modules. Constantly, SJ Product is equipped with Video box feature. It’s a very cool way to present your information through a simple way. The beautiful template is equipped with the best content extension – K2. This extension used by millions Joomla users around the world, become easier than ever to build a nice blog right on your website. Specialy, SJ Product is integrated with K2 Store component, a “Simple, Smart, Easy Shopping Cart”. This component supports many famous payment methods: Paypal, Authorize.Net and SagePay. Your website will easily become an online shop just in 10 munites. As a multilingual template, SJ Product also supports RTL (Right to Left) Language based designs like Arabic, Farsi & Hebrew….